← The moon was a ghostly galleon! 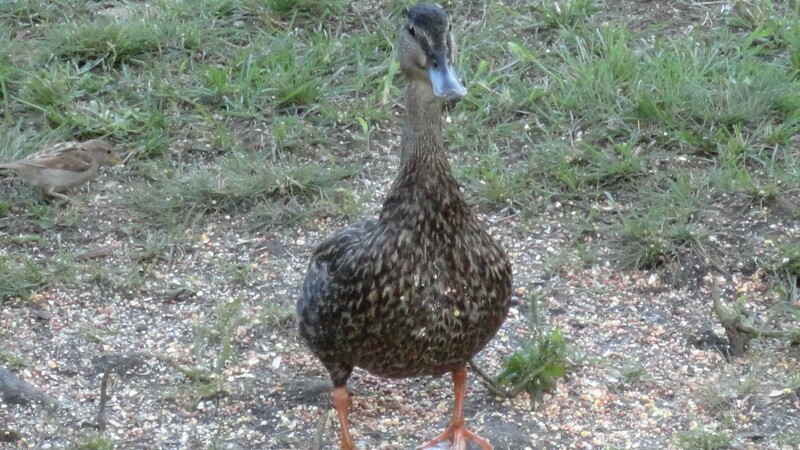 While filling the feeder tonight, I heard a soft quack behind me. Mama! You would have thought I had just been visited by Apollo, I was so exc ited. I knelt down to offer her some cracked corn, and she came closer to feed, taking the corn right out of my hand.”Where have you been? Where’s Daddy? Did you lay eggs? Are there babies?” Ignoring my questions, she quietly fed, her beak pressing against the skin of my palm. She hung around to feed and rest, then went on her way. Thanks Mama for stopping by. Hope to see you soon. The heat and rain have kept me from gardening and the weeds took advantage of situation to explode in the gardens. It didn’t take long to fill my wheel barrow. While maneuvering it across the road I spied what I thought was a rock. Well, damn, if that rock did n’t have two beady eyes and a tiny screech. 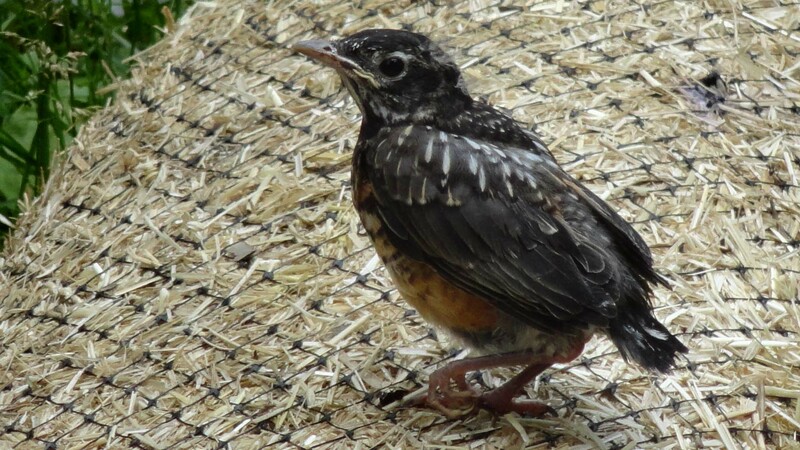 It was a baby robin! 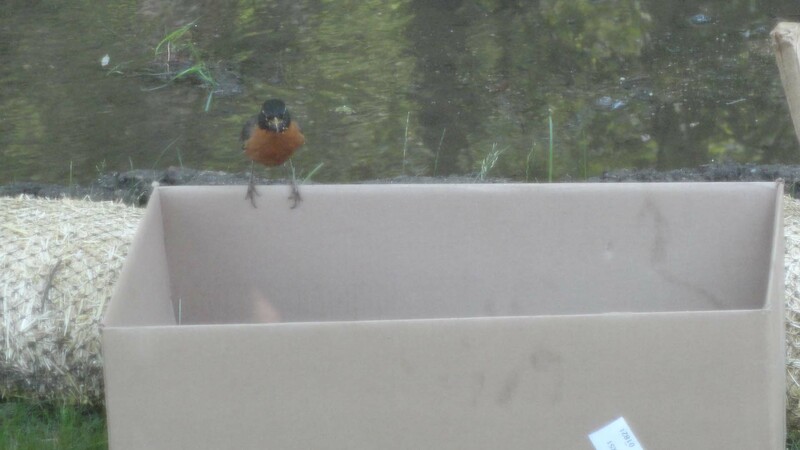 It started complaining as soon as I came closer to inspect it and within seconds it seemed like every Robin in Billerica was flying around the trees, screaming at me. Assuring the adults I meant no harm, I picked up junior and placed it on side of the road. It couldn’t have been more indignant, screaming and flapping it’s useless wings. Every time I put it on the straw, it hopped back into the middle of road. For all I knew, it could have had a death wish and I was messing up its plans. The adult birds were still in the trees, cawing at me to get away from the kid! Let me stop here and dispel a myth about baby birds and their parents. Handling a baby bird will not keep the parent away. If the baby is accessible, the parent will continue to care for it. Unless, of course, the baby is as flat as a pancake. I put the junior in a box lined with leaves, placed the box on my lawn, went inside and sat by the window and waited. Sure enough, along came an adult robin with some food. Feeling smug because I saved a life, I danced around a little then went back to gardening. I have to give credit where it’s due, though. My sister suggested the box. I was going to bring junior into the house and raise him as my own. Hey, it worked for Robert Stroud. Since I’m on the subject of birds, it seems to me that birds don’t take advantage of the great gift that has been bestowed on them – flight. Most birds around my river fly from point A to point B. Feeder, branch, ground, fence, it doesn’t matter. They use their wings to get them to a location and their legs take over from there. But not all birds. Tree swallows seem to have it right. 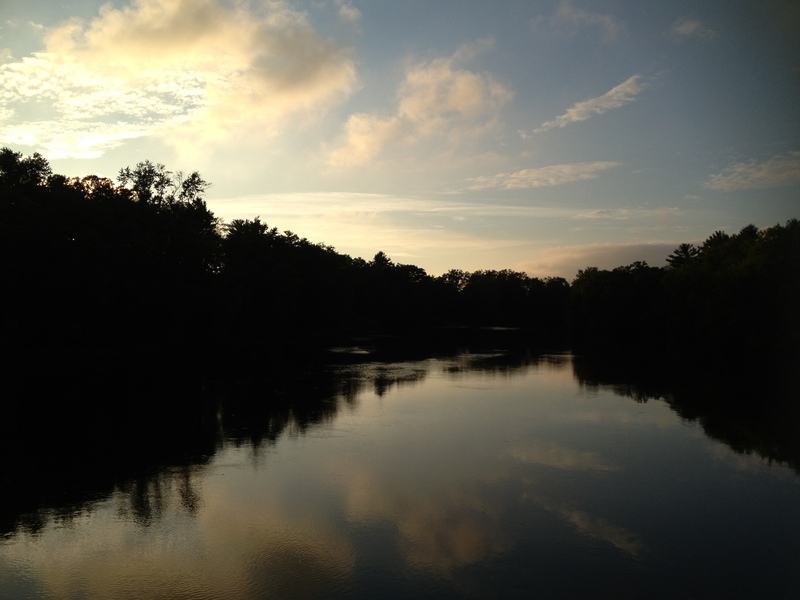 They swoop, dart, twirl, chase, and propel themselves through the air, along the water, and into the clouds. Sure, I know they’re catching insects but they do it with such abandonment. In my next life, I’m coming back as a tree swallow. I want to fly with joy and feel the wind against my feathers. However, if I’m going to be reincarnated, I definitely don’t want to come back as a toad. Not when the spinning blades of a lawn mower threaten to mutilate me. 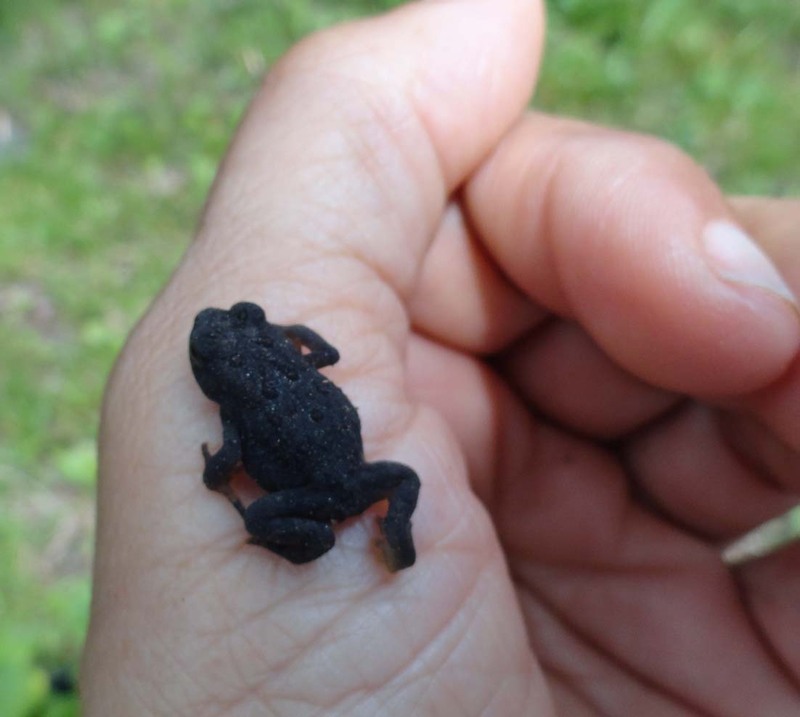 Once, while cutting the grass, I chopped the rear legs off one unsuspecting toad. Crumbling onto the grass, I held it’s bleeding body and cried. Chris thought I had lost my mind and told me to get over it. So now, when I mow, I watch for rocks, sticks, baby birds, snakes, and toads. Aside | This entry was posted in Life on the Concord River and tagged Apollo, baby birds, bird man of alcatraz, bridge, cutting the grass, fledging, gardening, Gardens, lawn mowers, Porgy and Bess, reincarnation, River Street, River Street bridge, Robert Stroud, saving baby birds, toads, tree frog, Tree Swallow, weeding. Bookmark the permalink.